Secretary Albert F. del Rosario poses for a photo with Foreign Minister Julie Bishop, Trade Secretary Gregory Domingo, and Andrew Robb at the DFA main building in Pasay City on February 20, 2014. 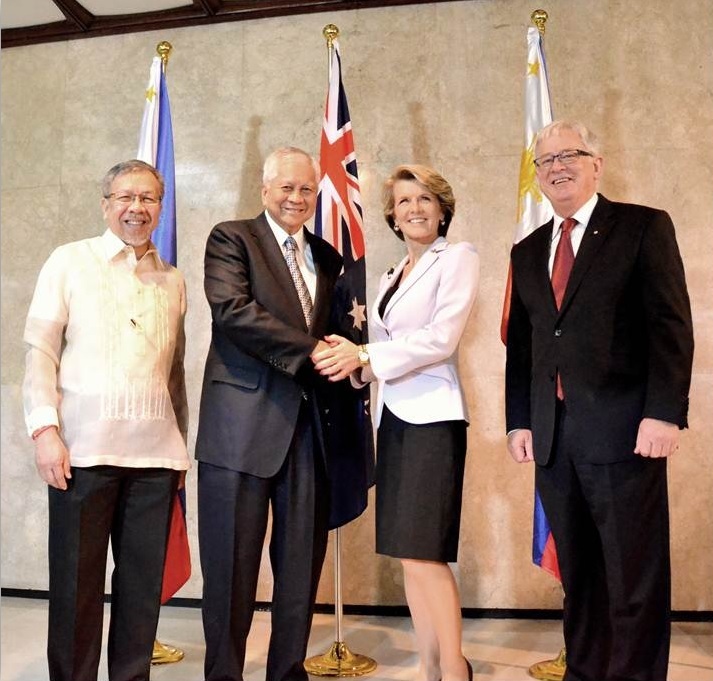 Secretary of Foreign Affairs Albert F. del Rosario and Secretary of Trade and Investment Gregory L. Domingo met with their counterparts, Minister for Foreign Affairs Julie Bishop and Minister for Trade and Investment Andrew Robb, and discussed issues of mutual interest, and various political and economic developments in the region. The Ministers affirmed their commitment to strengthen Philippines-Australia bilateral ties, specifically in the areas of political consultations and dialogue, trade and investment promotion, and people-to-people exchanges.